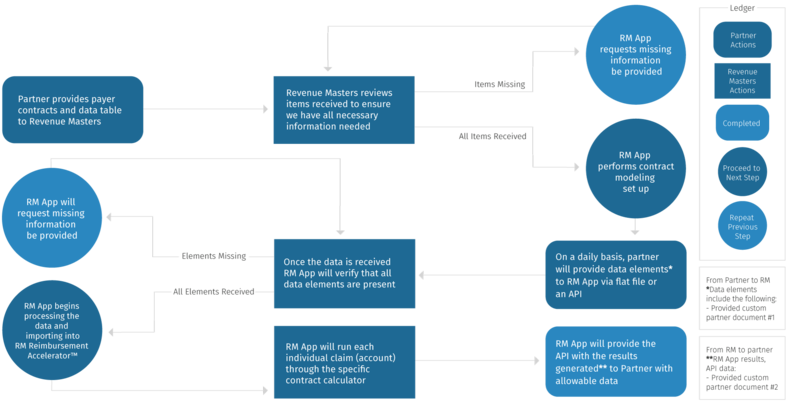 Revenue Masters offers a customized program via the RM-API. The RM-API powers your current technology to supply it with the contract management and modeling functionality and benefits your clients have been asking for. Contracts are modeled by Revenue Masters into the RM software after your providers’ payer contracts and data tables are supplied. The RM-API will then return the daily calculated allowable with “audit notes” as to how it was calculated to the partner software application. Partner with us for better contract modeling that accurately assess, measures and captures all revenue owed per your payer contracts.